Thank you all for your patience during these times. We appreciate all your support whether that be calling, writing letters, or showing up for action! As of right now, we don’t have any new updates about our displacement. However, please stay tuned within the next two weeks to hear more about what our future is looking like. We will be taking a much needed break this following week, so please note we will be closed from Nov. 18 - Nov. 27. We will be retuning to the office on November 28th. 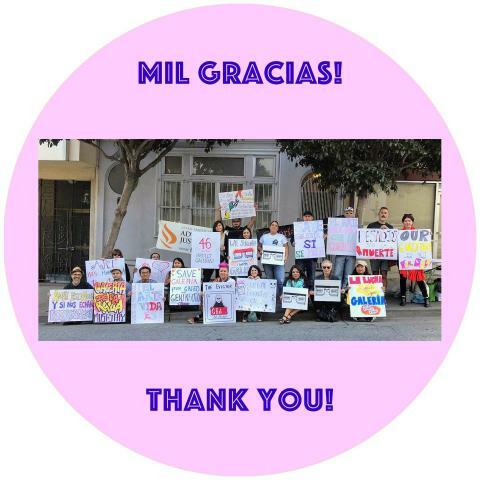 Again, mil gracias for all you support. It means the world to us! It is with a heavy heart, but a spirit of determination and perseverance, that we want to share some updates with our close family of supporters. The news is twofold - an update on changes to our current space, and share in confidence a long-term plan to secure permanent space. The online publication includes essays by Tere Romo, Tomás Ybarra-Frausto, and an extensive chronology of Galería's 40-year history.